I went to a food court with my family and had a nice dinner. After dinner we ordered some drinks from a nearby stall. Unknown to us, there seems to be some territoriality issue in serving customers at this food court. A row soon erupted between two drink stalls and we were the ones that apparently caused it. It seems Stall A could not serve drinks to a few of the tables where customers are seated. That right belongs to Stall B. How could we know? We were mere innocent paying customers. Isn't there a saying that supports the right of the customers that sounds like: THE CUSTOMER IS ALWAYS RIGHT! How wrong were we in this instance. Have you come across this type of problems in a food court before? Probably this happened 20 years ago. Today I believe, in most food courts it is the owner who sells the drink. If the food court is owned by the shopping complex, then it leased out to hawkers and there is no territorial rights. You are right there. I am talking about our old Medan Selera in Section 14, PJ. Go there and you can see one mamak women sitting at your far left. Try sitting there and order your drinks from another stall. The other stall is most likely not sell any drinks to you. He may perhaps advise you to change tables instead. Know what I mean, my good friend? The old Medan Selera in Section 14? You mean the current Computer Mall? 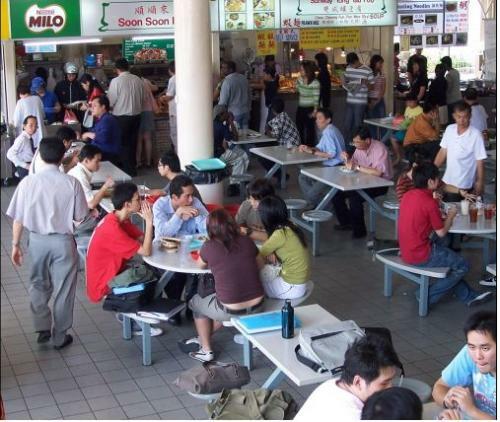 I beleive the food courts of today are so much different, We can sit anywhere in the vicinity and order from any stall you like there is no problem. it seems there is some sort of jealousy between the two stalls and you were the innocent victims,i dont think you were wrong,the concerned stall people should have informed you beforehand. Yes, you are right there. But then sometimes you never know such problems will actually flare up. Perhaps, this was the time that broke the camel's back. Anyway, modern hawkers should negotiate out of their own problems than load their anger on clients. Modern food courts are better. No such territorial issues. I believe these hawkers belong to the old school of thought. To them, do not occupy our seats because only customers who buy from us get to sit there. However in newer food courts, there is already an understanding and customers can sit anywhere. Also someone collects all the dishes once you are done with your meal. Believe me, this kind of practice also happens at an open hawker area in Section 17, Petaling Jaya. The guy who sells porridge made from an assortment of sweet potatoes,yams and other Chinese condiments told us not to sit on the other side of his stall. He says the women stallholder on the other side will take offense if you do not buy her food and yet orders the porridge.So, to ensure peace prevails, he advised his customer from sitting at the tables nearest to that territorial women hawker.